Casino.com has leapt on board the World Cup gravy train with a fun casino promotion. There’s a different bonus to pick up every day until Thursday 28th June, simply by taking penalties. Anyone over the age of 18 and who has made a deposit at the site can play this Casino.com football promotion. However, members of the England squad might want to avoid it, given their record from 12 feet! You can’t help but notice that a great number of UK casino sites are currently tying in bonuses with the action in Russia. Casino.com’s promotion isn’t the most lucrative, but it is certainly fun. In addition, you can pick up some fine bonuses for very little effort, so it’s a lot more accessible than some casino deals. You earn a specified number of free plays on games at Casino.com. Depending on the game in question on the day, these can be worth between £0.10 and £0.40 each. Casino free spins are a great way to join in with a slots game you might not be familiar with. They allow you to try it out without risking your bank roll. Alternatively, they may be for a game that you already love, in which case, you get to play it even more! There is a 20x wagering requirement on anything you win on the free spins. This is very generous given the standard in the new casino world. You need to play through the combined value of your winnings 20 times, reinvesting your additional prizes, until you can withdraw the amounts as cash. Reload bonuses are deposit bonuses by another name. You earn an amount of bonus funds that relates to the amount you deposit into your account. For example, a 50% deposit bonus would mean if you credited your account with £100, you would have another £50 on top in bonuses. This would give you £150 to play with altogether. In order to withdraw prizes you win on your bonuses, you have to play through the bonus amount 40 times. Casino.com gives you a mission to wager a certain amount on a slots game in order to release some free spins. Complete the mission and you get up to ten spins on the game in question. These also come with a 20x wagering requirement. You can earn cashback of 30%, up to £30 on specific games at Casino.com. This cash comes with no playthrough requirement, so you can use it to fund new games or withdraw it if you wish. 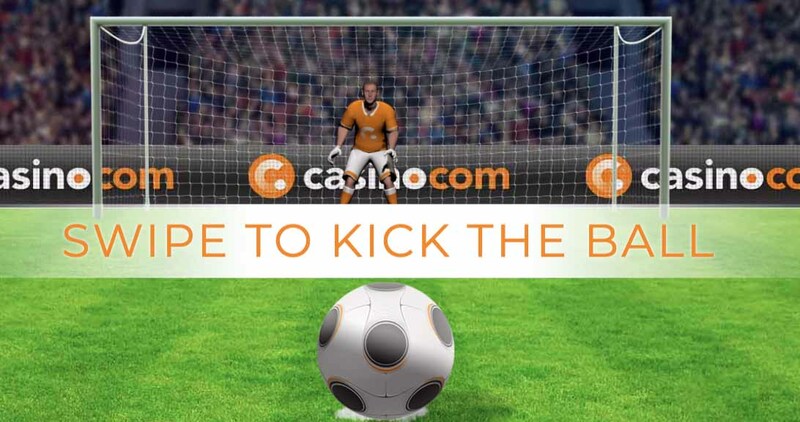 Head to the Promotions page of Casino.com and find Penalty Shootout. Hit ‘Join Now’ and you find yourself in the stadium, facing an energetic goalkeeper. Simply swipe the screen and blast the ball (hopefully) into the back of the net. After you take your fifth penalty, a pop-up appears on screen to tell you what your bonus is for the day. You can only play once per day in the promotional period. Each bonus fits into the categories above and the pop-up tells you details such as how many free spins you win and on which game you can use them. You’ll find out the qualifying cashback game, the level of the reload bonus and the amount you have to wager to unlock after-wager free spins. Follow the link to claim the reward and, fingers crossed, pick up some sweet, sweet wins. You must have made your first deposit at Casino.com in order to play. Each day runs from 00:01 to 23:59 GMT and you usually have to use the bonus on the same day. Take a look at the full terms and conditions when you visit the site. Casino.com is a reputable brand in the UK casino site market. It is part of the Mansion Group, which has both online and offline casino interests. Our expert reviewer was impressed with its 24/7 support and great range of table games in particular. It earned a 7.6 rating on SpinCazino, and you can read the full online casino review to find out more. The site runs an array of promotions to keep existing members happy. The Casino.com welcome package features an initial deposit-match bonus and a series of reload bonuses that can boost your spending power considerably. Tap the logo below to read the review, or visit Casino.com right now by using the button.